It is my humble opinion that Paul Simon is a national treasure. A gift to music (and life itself) that could never be replicated, duplicated or perhaps fully explained. I know (very well) that I'm not alone in this feeling. My roommate and I often cite Graceland as our favorite album of all time, and our parents generation? Come on, they got to grow up with him! 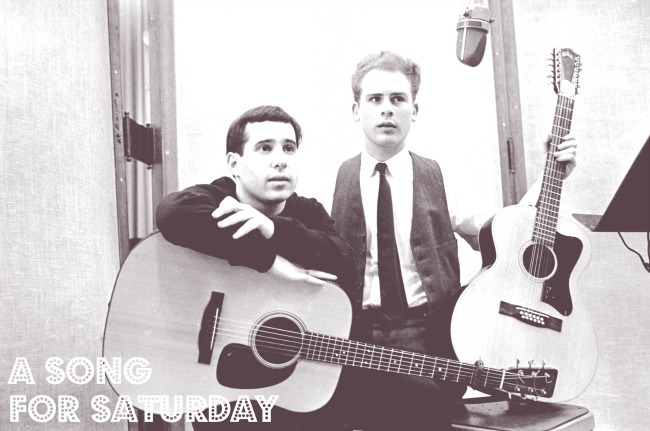 Before there was just Paul Simon (his solo career began in the 70s), there was Simon & Garfunkel. Folk-rock pioneers of the 1960s, the perfect marriage of their vocal harmonies and storytelling gave us gems like "Mrs. Robinson" and "The Sound of Silence." Every song can feel like an experience on it's own, but if I had to pick just one that really gets me, it's "Cecilia." To me, this song is Saturday. It's waking up. It's making coffee. It's feeling happy because you still get another day after this to relax. It's getting together with friends to have a picnic in Central Park or hit the road for a long, lazy drive up the Hudson River Valley with the windows down. Cecelia, though a song about distress over a straying woman, embodies happiness for me. I hope it does the same for you -- and you're having a fabulous weekend. I love love LOVE Simon & Garfunkel. Basically 60s/70s music is my JAM, and S&G is perfect for sunny spring days. Hope you're having a great weekend too!